If you’re planning a 2018 wedding, you’re in luck! This year has some exciting new trends in store, from beautiful bridal wear to stylish wedding decor. The 2018 colour of the year is a vibrant Ultraviolet hue and can be paired perfectly with this year’s trending wedding ideas. This stunning shade has made way for some dazzling colour schemes. While last year we saw botanical greens take over centrepieces and adorn walls, this year we will see a cosmic twist in wedding décor with this deeper mystical shade of purple. It’s easy to find a colour or idea that you love but not always easy finding a way to tie it into your day, so we’ve simplified the process for you by narrowing the list down to our top picks! As you begin planning your big day, we encourage you to sift through our trend guide and select a few favourites to shortlist. We’re sure you’ll find one you love! With a beautiful array of florals in this shade of purple, you are spoilt for choice. Some favourite species include orchids, hydrangeas, anemones, calla lilies, peonies, roses, dahlias and more. Sprinkle irises into your bouquet or go all out with a hanging arrangement full of violet buds – either will make for an out of this world theme. While both creative and inspirational, the colour purple has been associated with royalty and power for centuries. This regal heritage makes the shade perfect for a wedding. When guests receive their invitation to your ceremony, you want to instill feelings of excitement and exclusivity. The complex colour of purple can do just that. Following the trend in florals this year you could add a border of violet flowers as a delicate accent. For a more luxurious look, you can dress up your invites with elegant gold calligraphy on simple deep purple cards – ideal for a winter wedding theme. Instead of overgrown and oversized centrepieces, we’re seeing simple, and eye-catching succulents take centre stage of table décor. For an understated style, combining purple and green toned succulents with hints of ultraviolet glassware can make for a tasteful table runner. For the dramatic and glamorous bride, you can opt for a sultry muted violet and aubergine roses with leafy foliage. With the colour purple being known to have a calming and de-stressing effect on the mind what better way for a bride to ditch their wedding day nerves than to surround themselves with bridesmaids adorned in the uplifting shade. In line with this year’s velvet bridesmaid trend, this deep shade of purple on the opulent fabric can be a luxurious accent to your bride tribe. For the rustic outdoor wedding theme, tiered ruffles are also making a comeback. Picture a spectrum of flowing gowns in violet and lavender hue dresses against a summer green field, a perfect contrast for the wedding photographs. 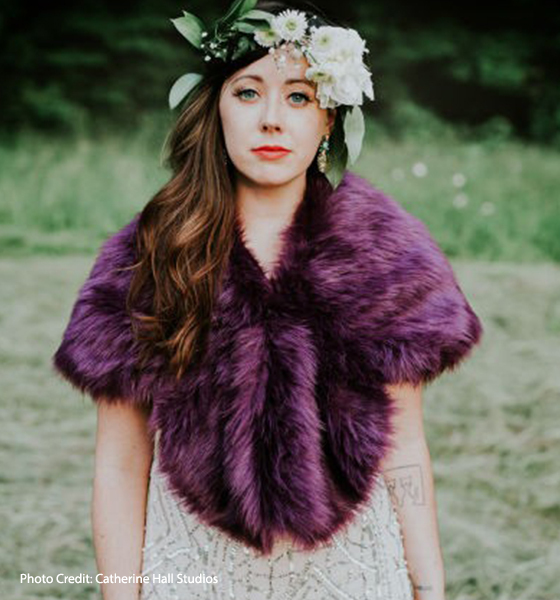 If full-length violet is a little too bold then why not accessorize simple mute toned dresses with a vibrant purple shawl or embellishes cape, they are all the rage for 2018! According to Pantone, the beautiful shade of ultraviolet symbolizes experimentation which is why this year we will see many mixologists getting creative with spirits, infusions, and garnishes. Perfect for a Summer wedding, the Aviation cocktail is both flirty and refreshing and combines gin, lemon juice, Crème de Violette, maraschino liqueur and simple syrup. Delicious! For Winter weddings and those who would prefer a subtle twist on a classic aperitif, a champagne cocktail infused and garnished with the sweetness of the seasonal plum can be a subtle twist. Of all the elements in planning your wedding, your wedding cake is one of the most creative ways to implement the mystic ultraviolet shade. Trendy yet elegant, Marble is a growing trend in décor, and it’s making its way into weddings. The Calm, cool and flawlessly unique characteristics of Marble pair perfectly with the similar calming qualities of purple which is why we especially love the stunning Geode cake with a purple-toned marble effect. For all the indecisive foodies, dessert tables are a delicious smorgasbord of treats that not only cater to all sweet tooths but also provide an exquisite and enticing aesthetic to your wedding décor. Showcasing a couple’s favourite treats, you can get creative with cupcakes, tarts and smaller desserts adorned with violet flowers, textured lilac icing and plum drip cakes. Whether your theme is rustic or romantic, rest assured you can tailor your dessert table to suit your theme as well as keeping all your guests pleasantly satisfied! Surprise your guests with a splash of violet incorporated into your table setting or go all out with a variety of patterned china. While purple is an extravagant colour, when used correctly, it can add just the right amount of charm and elegance to a tablescape. Keeping a minimalist colour scheme with a striking plum coloured napkin can make your decor pop while not overwhelming the overall theme. 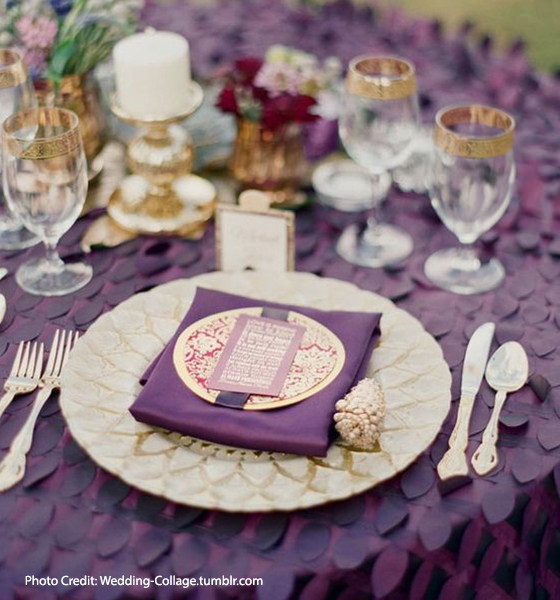 If you already have an excessive amount of purple on the table, consider adding a metallic coloured item like a plate or ornament that will complement the vibrant tones. Copper is a popular choice this season alongside silver, gold and translucent coloured glass. Instead of something blue opt for something violet for a fun and modern take on a traditional custom. If rocking a wedding dress in a bold shade of violet seems a little too extreme, you can incorporate the shade in a number of other subtle ways. Opulent silk wedding shoes in luxurious purple can be a quirky fashion statement. Painting your nails in this stunning hue can also be a fun way to coordinate with any of the above wedding décor ideas. For all the whimsical brides out there, this is your chance to jump on this year’s bold colour trend with a stylish violet mane; you can go for a full head of highlights or perhaps dip-dye your ends for a funky alternative approach. For something simpler, a jewelled hairpin can be a nice to touch to any hairstyle or a perhaps a delicate charm bracelet as a bridal accessory. Let your imagination loose and embrace the innovative nature of this year’s colour trend. If you are recently engaged or looking to plan your special day, give our super wedding planners a call today on 01242 245 071 or email weddings@manorbythelake.co.uk to book a private tour of our stunning country Manor House.